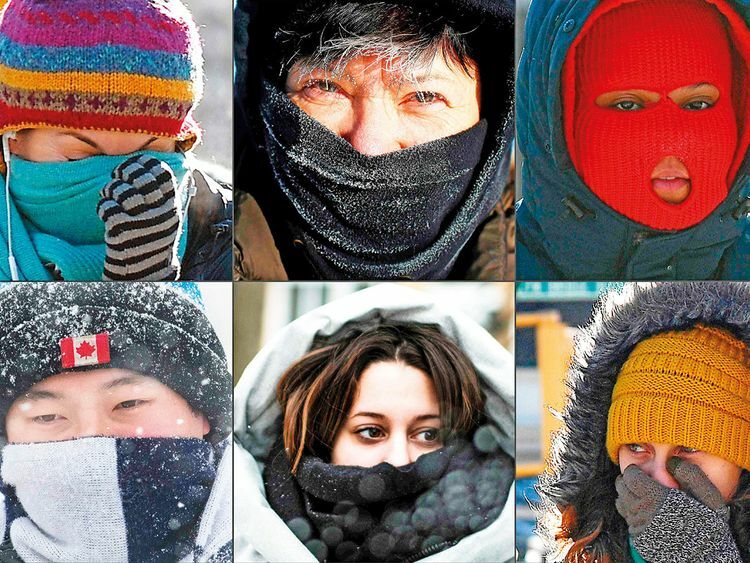 Detroit: Much of the US Midwest was preparing for a rapid thaw after this week’s polar vortex sent wind chill temperatures plummeting below -50 in some places. But the transition to warmer conditions threatens a new set of problems. Ruptured water mains, leaky pipes and gutters, an influx of potholes and flooding of roads and bridges are among the potential repercussions of such a sudden temperature swing. Two dozen busted water mains were being patched on Wednesday in Detroit, and that number grew to 44 on Thursday. But with temperatures pushing 50 degrees expected soon, there could be far more. Palencia Mobley, deputy director and chief engineer for the Detroit Water and Sewerage Department, said the primary culprit is the contraction and expansion of the soil around the water mains. Inside homes and businesses, there was a threat the changing conditions could cause pipes to break or roofs to leak. Often a sudden thaw forces water rapidly through the pipe, or to a faucet closed by expanding ice. “I have gotten more calls on frozen pipes today than in the previous three years I’ve been here combined,” said Cathy Lombard of Barnes Plumbing in Minneapolis. Leaking also is a frequent by-product of massive temperature swings. Before the cold snap, several inches of snow fell across many parts of the Midwest. The sun or warm air up from attics melted some snow on pitched roofs, but the low temperatures caused the runoff to freeze before it was able to leak or drain from gutters. The ice formed a barrier. When remaining snow on roofs melts, the water can leak into attics and down interior walls. Above ground, Midwest freeze-thaw cycles also mean potholes on streets, roads, freeways and bridges. They form when melting snow or rain gets into tiny cracks in the pavement and the base beneath it. The water freezes when temperatures drop and expands before melting. Repeated cycles weaken pavement which eventually crumbles under the weight of passing vehicles. On Wednesday, AAA Michigan was getting swamped with dead battery and flat tire calls. By Thursday, it was damage to vehicles due to motorists slamming into potholes that weren’t there the day before. “First there was snow. Then, record-setting low temperatures. Now, we have the warming coming,” said Nancy Cain, spokeswoman for the Dearborn-based auto club. Officials in many communities hit by the deep freeze were watching for potential flooding that can result after rivers freeze over, causing water to back up behind big chunks of ice. That could be exacerbated when the ice begins the thaw and piles up. A bridge in the western Michigan community of Newaygo, about 65 kilometres north of Grand Rapids, was closed because of flooding from a 30-kilometre ice jam on the Muskegon River. Authorities say the river is already above flood stage and warn residents that it could overtop with warmer temperatures and rain forecast for the coming days. Residents along the Kankakee River in northeastern Illinois are watching warily as huge chunks of ice are pushed onto shore. And in Niagara Falls, New York, Mayor Paul Dyster said emergency and public works officials are monitoring the river carefully because of high water and the potential for ice jams that could flood Cayuga Island.